It has only been about 5 weeks since Unreal Engine 4.20 preview 1 was released so today’s full release of Unreal Engine 4.20 is impressively quick. Some of the star features of this release include the new Niagara particle system, support for Visual Studio 2017 and beta Leap Magic support. Perhaps the biggest new improvements in this release however come from Epic’s work on the mobile version of their smash hit game FortNite. This release contains a massive number of mobile target improvements they gained from porting their own game to run on iOS and Android devices. As always Epic have released a massive and comprehensive release note available here. You can download the 4.20 UE4 release using the Epic Game Launcher. Today out of the blue, Epic games just released that they are changing the revenue share structure for sellers on the Unreal Engine marketplace from 70/30 to 88/12. Even more impressive, they are making this change retroactively for all sellers all the way back to when the store opened in 2014. This new 88% (developer) / 12% (store) revenue split applies to all Unreal Engine Marketplace transactions past, present and future. In addition to implementing the policy for future sales, Epic is paying out all Marketplace sellers retroactively, applying the more creator-friendly 88% rate to previous transactions dating back to the store’s 2014 launch. So, thanks to all the Fortnite money Epic Games is swimming in, developing for the Unreal Marketplace just became a lot more appealling. I wonder if other online asset stores will follow this move away from the now well established 70/30 split. 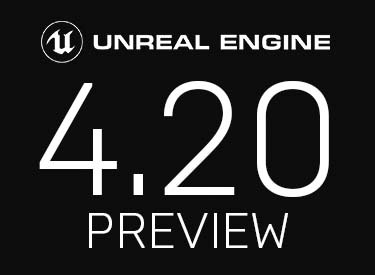 Unreal Engine 4.20 just got one step closer to production ready with the release of 4.20 preview 4. Generally preview 1 is the release with all new bells and whistles (like the new Niagara particle system), while each subsequent preview is all about purging the bugs and ironing out kinks that are discovered and preview 4 is no exception. This release contains 100% product fixes, but there are quite a few of them. If you are interested in learning more about the functionality that is being added in 4.20 be sure to check out our video, also embedded below. Fixed! UE-59928 Linux: suppressing -fPIE does not work as intended. Fixed! UE-60566 Standard error is spammed with "Used memory before allocating anything was"
Fixed! UE-60261 EngineTest - MeshOrientation tests fail with: "Screenshot 'MeshOrientationTests_After Runup' test failed, Screnshots were different!" Fixed! UE-60877 Renaming and deleting parameters from the system/emitter editor deletes and renames inputs in modules. Fixed! UE-60874 Crash when editing float function inputs. Fixed! UE-57633 ARKit: App Crashes when Swiped Off-Screen after Pressing "Start AR"
Epic have officially launched the first preview of the upcoming Unreal Engine 4.20. Of course this is Unreal Engine so you can expect a swath of graphical improvements, but there are several other new features as well. On of the key features of this release is Beta 1 of Niagra, their next generation programmable particle FX system. There are multiple new LOD tools, blueprint bookmark support, the ability to export sequencer data in Final Cut Pro XML format and a switch to Visual Studio 2017 for the default C++ projects. Included in Preview 1 are improvements to the proxy LOD tool, as highlighted in the May 17th livestream, many mobile improvements and optimizations we've made for Fortnite on iOS and Android, and early access to mixed reality capture. Niagara will be rolling out in early access, and you’ll also see a number of our GDC features, including the new cinematic depth of field and improved rendering features for digital humans at your disposal. You can learn a great deal more about the specifics of this release on the Unreal forums, or watching the video below. One of the major features in this release, Niagara, was heavily featured in this GDC talk, if you like me cannot get it to run but want to learn more. As always this update is available in the Epic game launcher. Also be forewarned, this is a preview release so don’t even think about using it in production! If you are an Unreal Engine game developer, Epic just announced a pretty sweet give away. They just released $12,000,000 worth of art assets from the 2017 MOBA Paragon. The assets include 20 AAA quality characters, fully rigged, textured and animated, ready for game deployment. Additionally they released 1,500+ assets used to develop game levels. The assets are usable without condition so long as you are using Unreal Engine. If you are using a different game engine you have no rights to any of these assets. To see the assets in action be sure to watch this video.